Hi Paul! You have to realize that the Summers were crazy times. It was not just the "regulars". People from all over the world came and the parking lot was quite crowded. Since most of these people had never seen The Beatles that close before, they were - understandably - quite frantic. The boys would dash out of their cars and go up those stairs as fast as they could. And you may have noticed that us regulars are hardly ever seen on photos from those Summers. It was very different from the rest of the year. At least, that's what I remember. 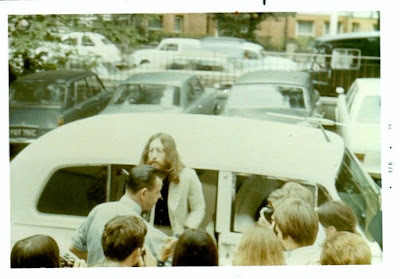 This date can't be right as John's first day back at work at Abbey Road wasn't until 9th July.